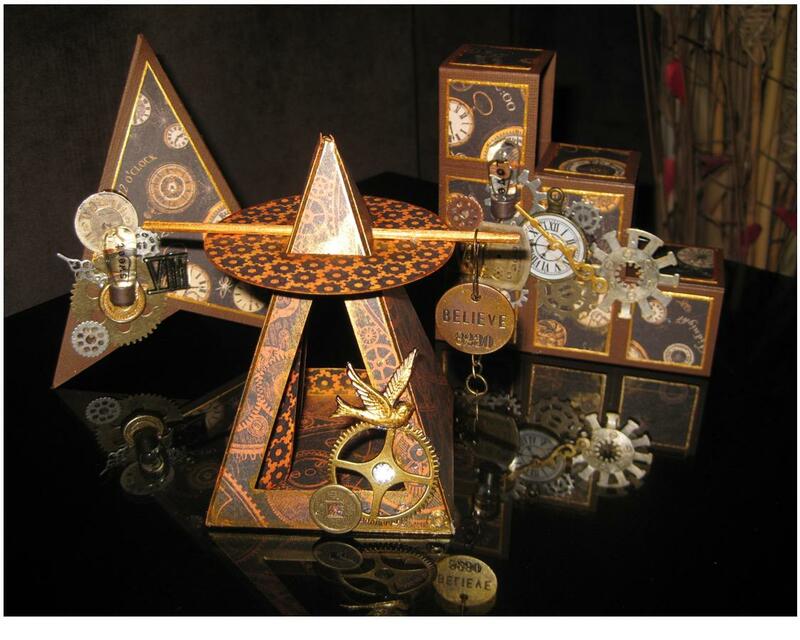 Create three completely different pyramid-inspired projects in one class! Tee Pee Pyramid (pictured on the left) folds flat for mailing and is a 3-sided creation with a hidden panel perfect for a written sentiment (“Happy Birthday” or whatever other sentiment you’d like the card to say). Pyramid with Stick Closure (center) is a triangular-shaped square box that opens to reveal a secret hiding place appropriate for a small gift or tasty treat. Block Pyramid (right) folds flat to fit into an envelope but stands on a rectangular pedestal when on display. Although the image shows steampunk-inspired embellishments, these three projects work beautifully in ANY theme (Birthday, Christmas, Get Well, etc.) As with all of my classes, a detailed instruction sheet with step-by-step illustrations is included. the nice quality writing, iit is rare to see a great blog like this one today. Thank you for your kind words. I used one of the themes provided by WordPress as a basis for my blog, and customized it a bit.